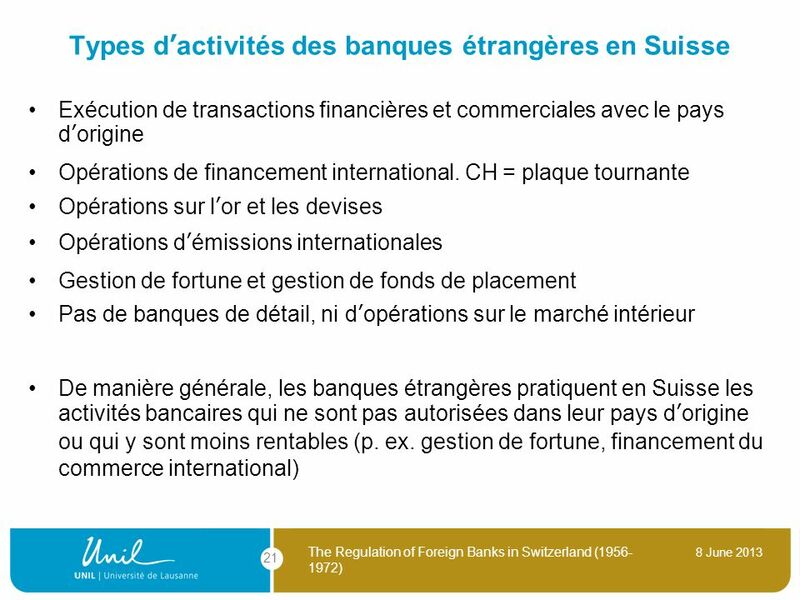 3 Source: Mazbouri/Guex/Lopez, Projet Place Financière Suisse. 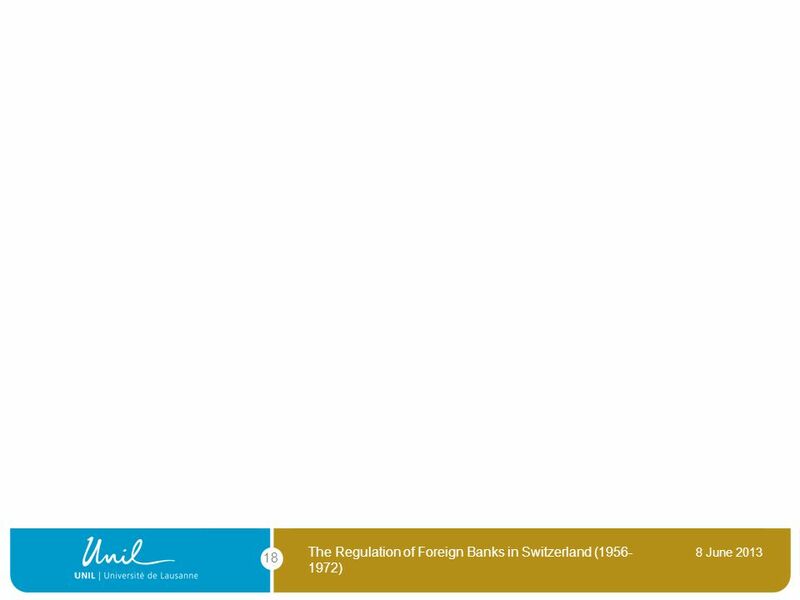 Source: 1958: Author’s calculations based on (E 6520(A), 1983/50, vol. 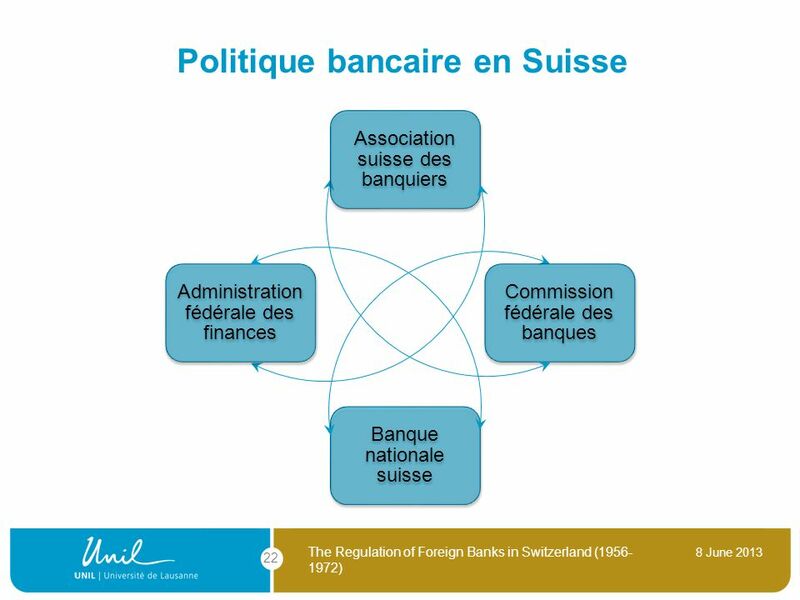 1, dossier « Ausl. 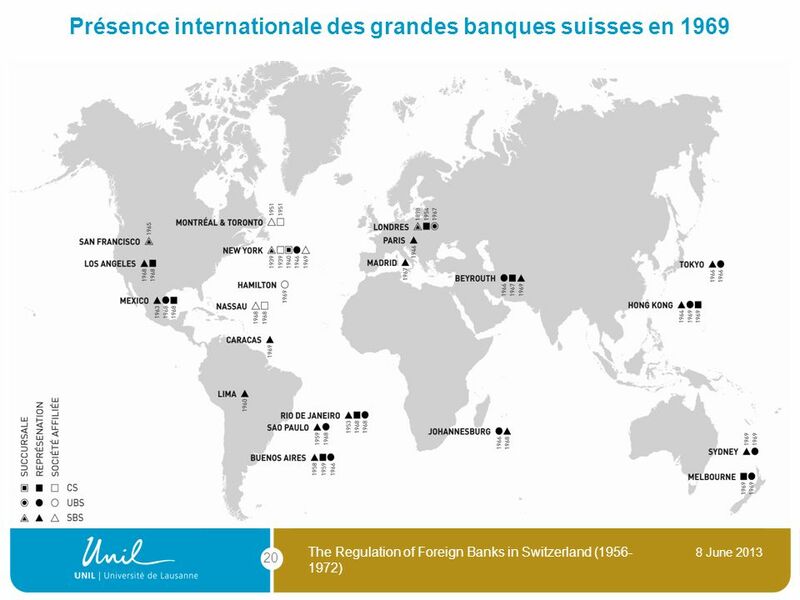 Banken »). 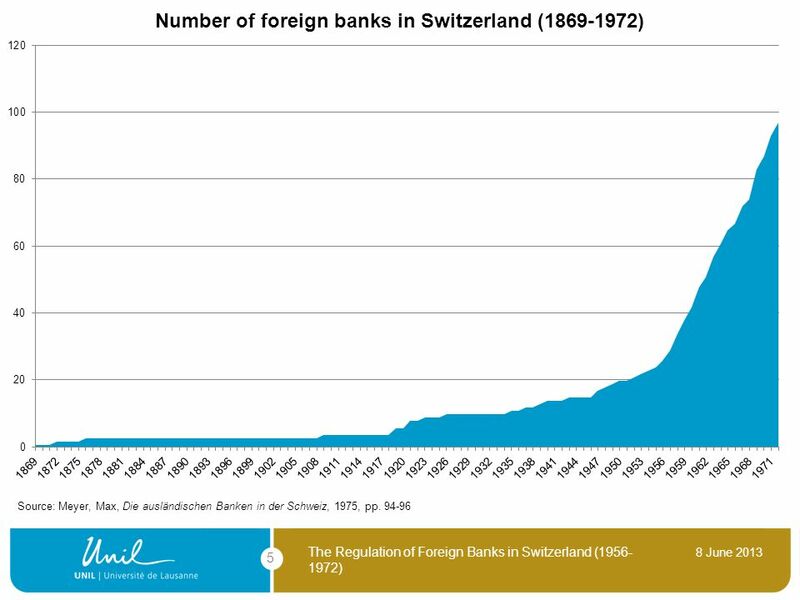 1972: Meyer 1975, 24. 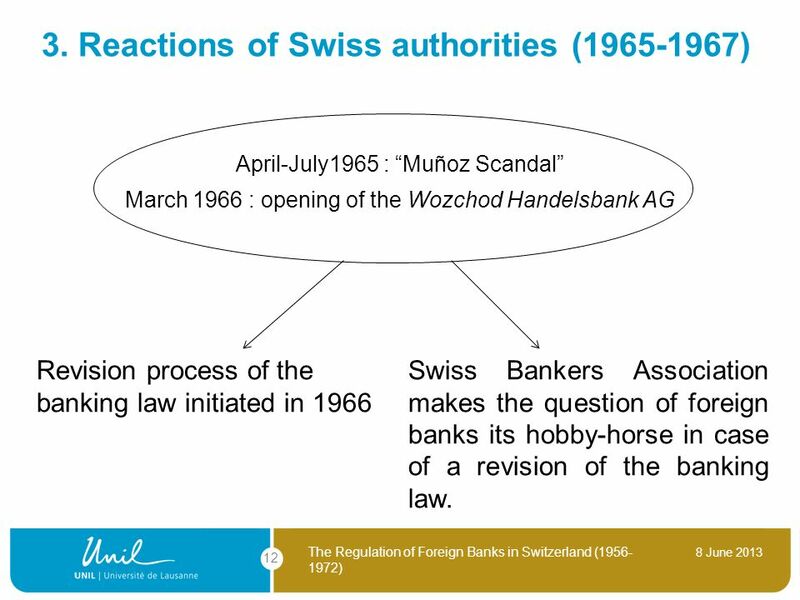 April-July1965 : “Muñoz Scandal” March 1966 : opening of the Wozchod Handelsbank AG Revision process of the banking law initiated in 1966 Swiss Bankers Association makes the question of foreign banks its hobby-horse in case of a revision of the banking law. 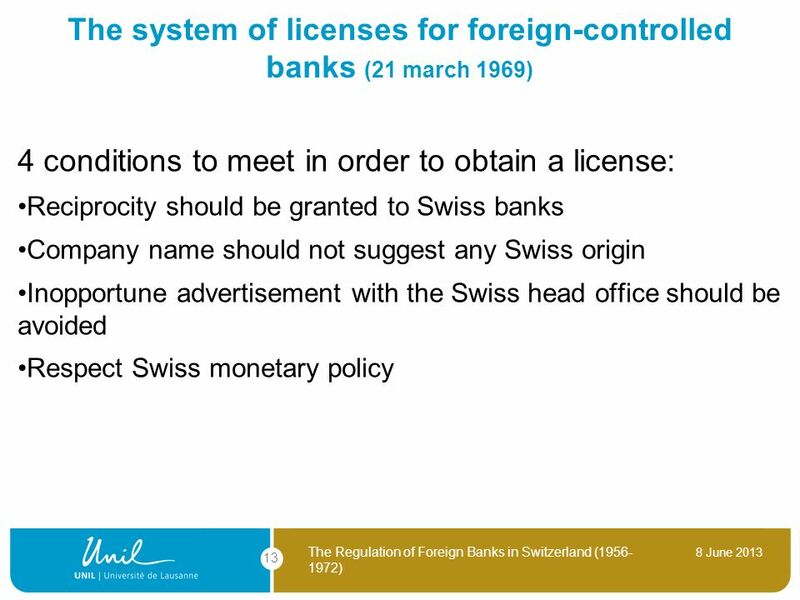 In the short-term, no reduction of the number of requests ( ). 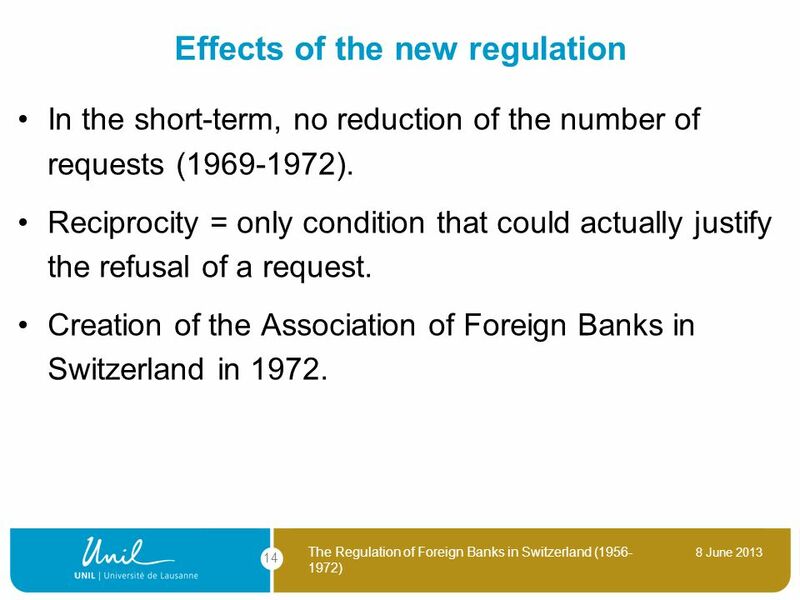 Reciprocity = only condition that could actually justify the refusal of a request. 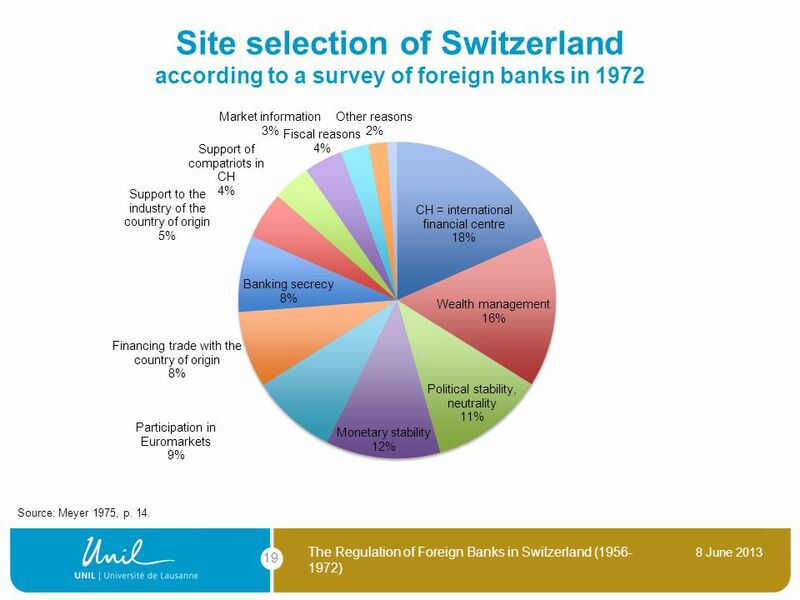 Creation of the Association of Foreign Banks in Switzerland in 1972. 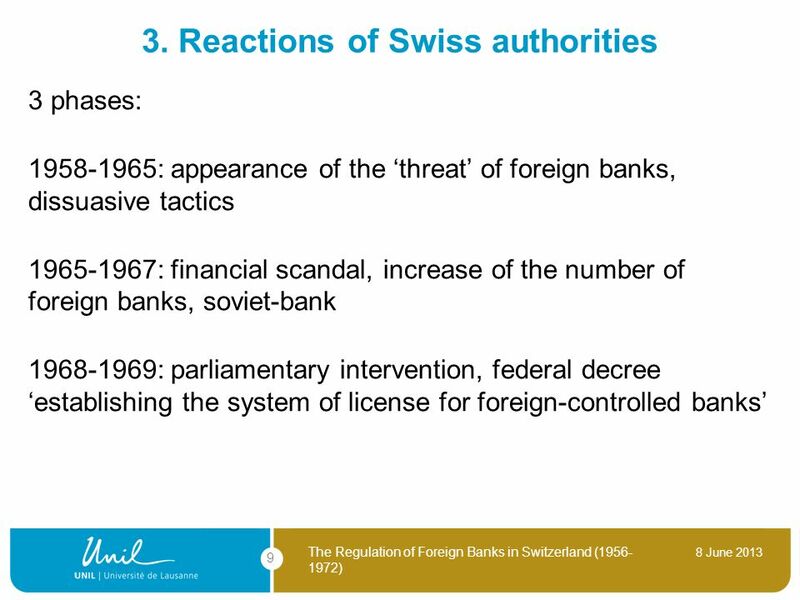 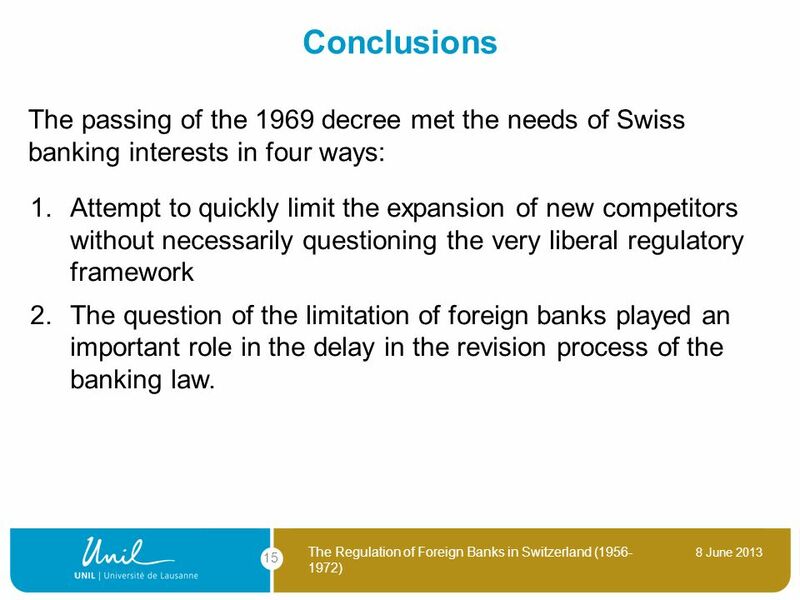 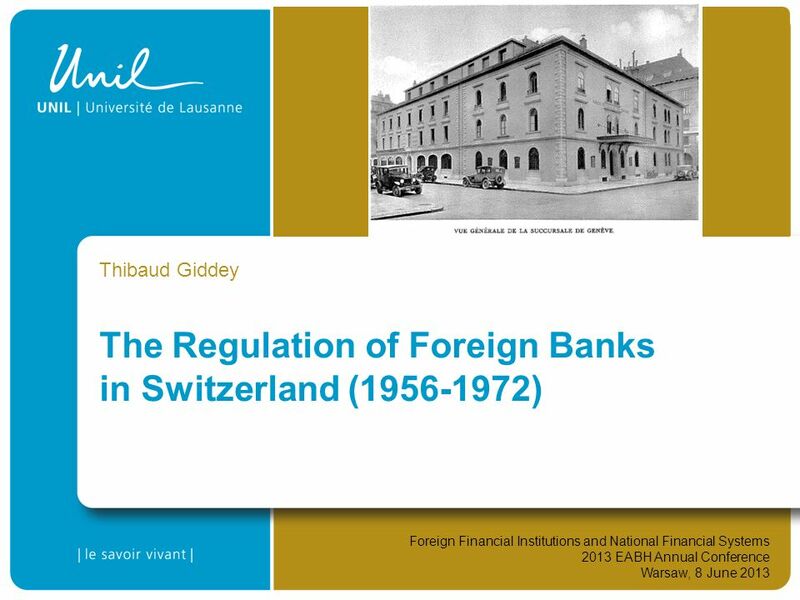 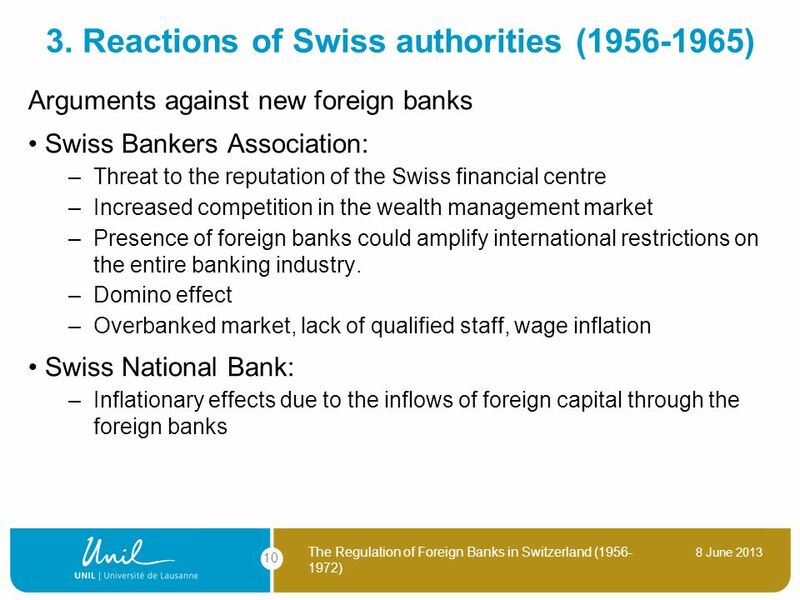 15 Conclusions The passing of the 1969 decree met the needs of Swiss banking interests in four ways: Attempt to quickly limit the expansion of new competitors without necessarily questioning the very liberal regulatory framework The question of the limitation of foreign banks played an important role in the delay in the revision process of the banking law. 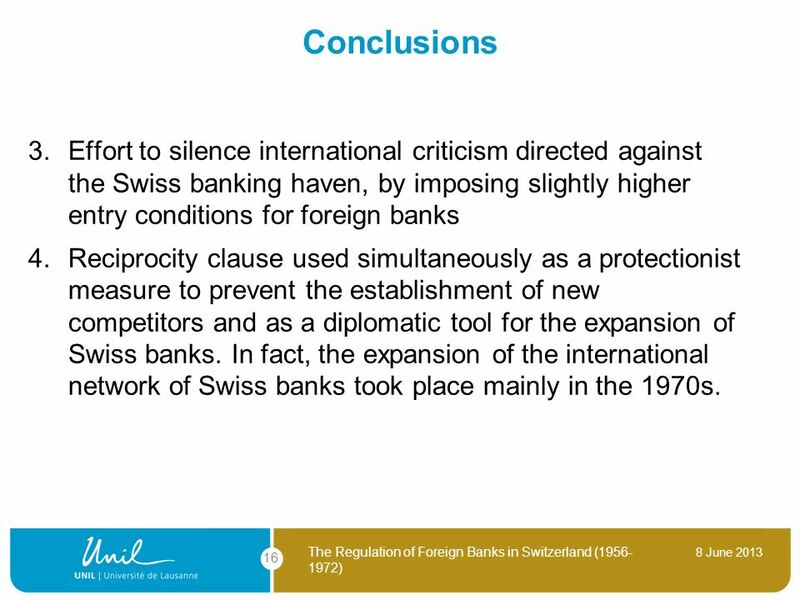 16 Conclusions Effort to silence international criticism directed against the Swiss banking haven, by imposing slightly higher entry conditions for foreign banks Reciprocity clause used simultaneously as a protectionist measure to prevent the establishment of new competitors and as a diplomatic tool for the expansion of Swiss banks. 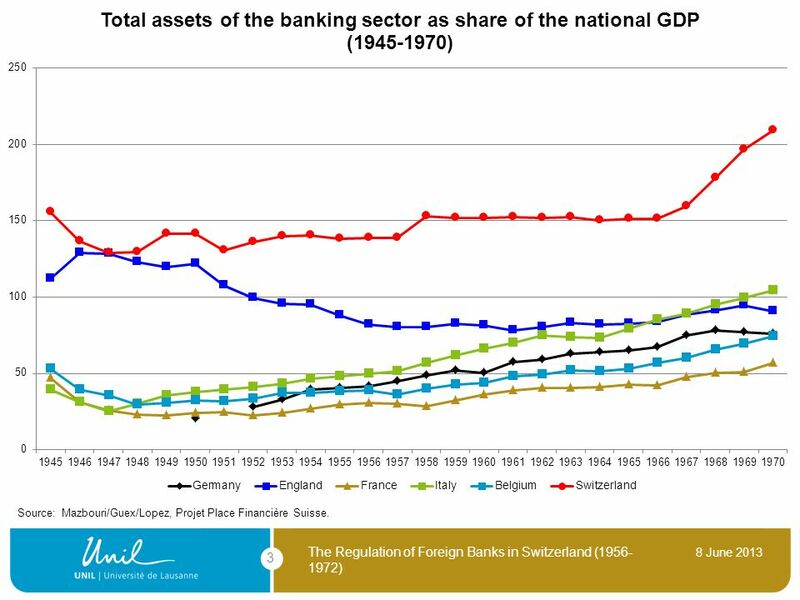 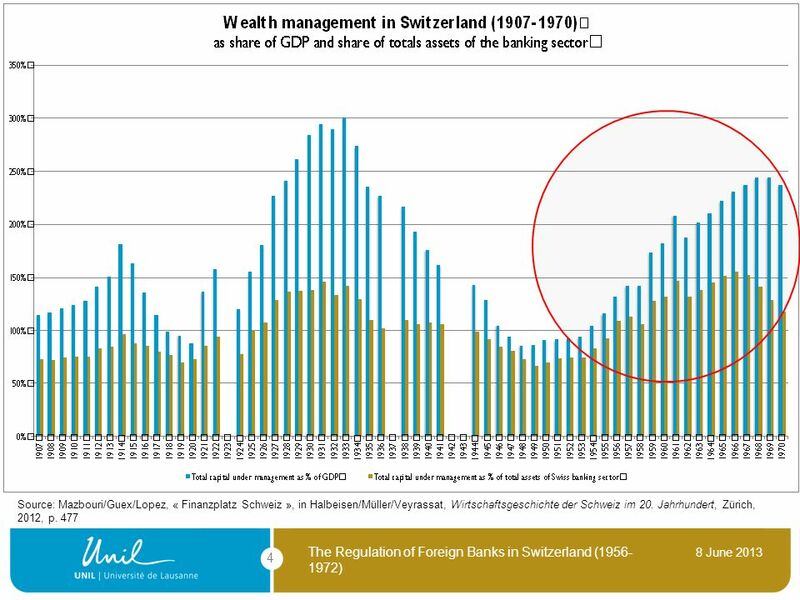 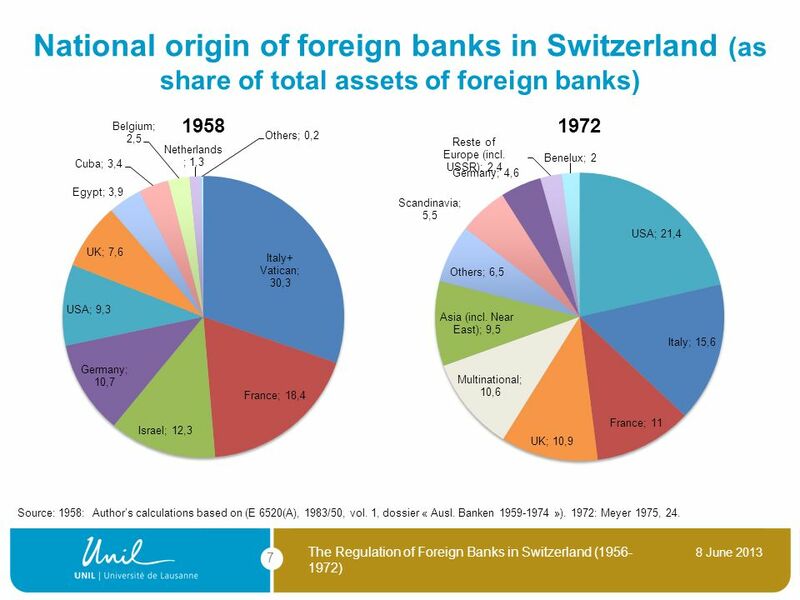 In fact, the expansion of the international network of Swiss banks took place mainly in the 1970s. 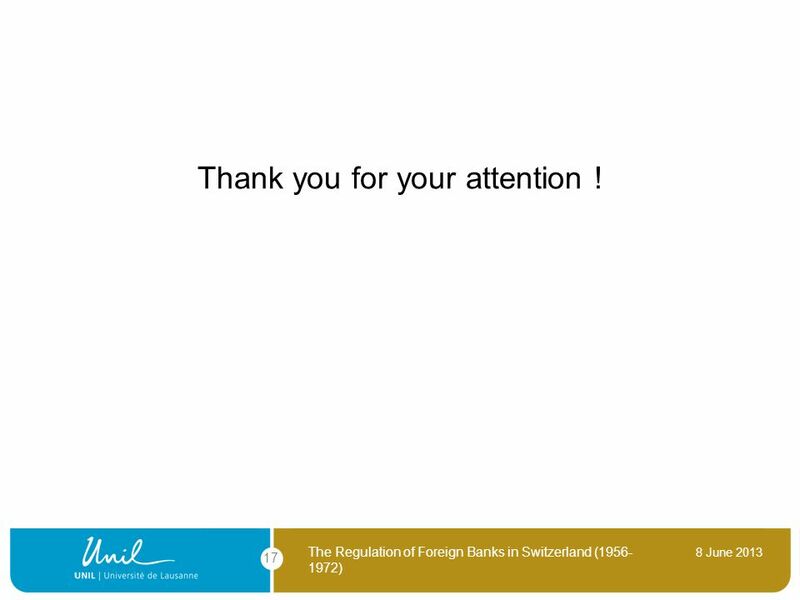 17 Thank you for your attention ! 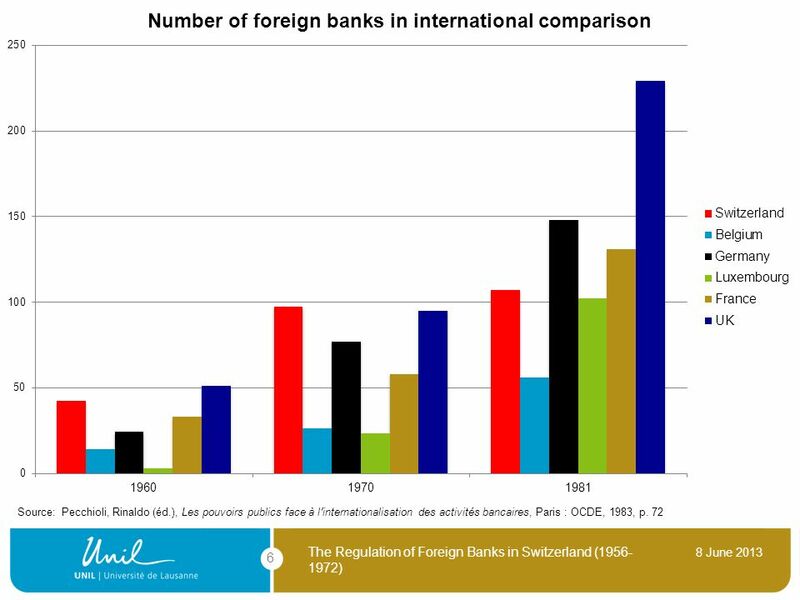 Source: Meyer 1975, p. 14. 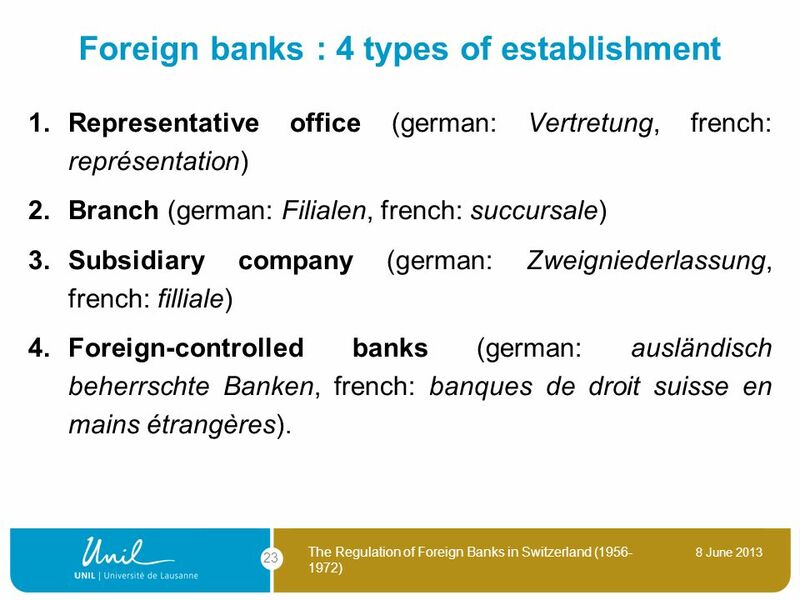 Representative office (german: Vertretung, french: représentation) Branch (german: Filialen, french: succursale) Subsidiary company (german: Zweigniederlassung, french: filliale) Foreign-controlled banks (german: ausländisch beherrschte Banken, french: banques de droit suisse en mains étrangères). 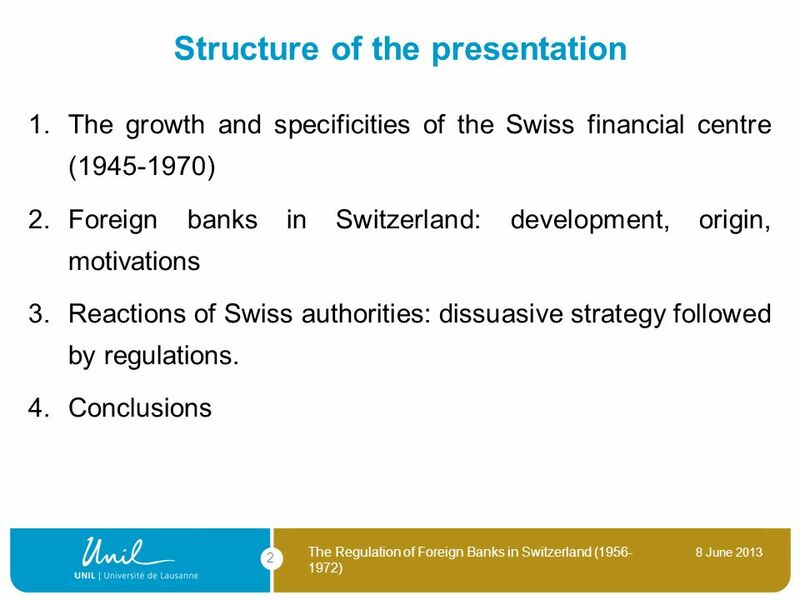 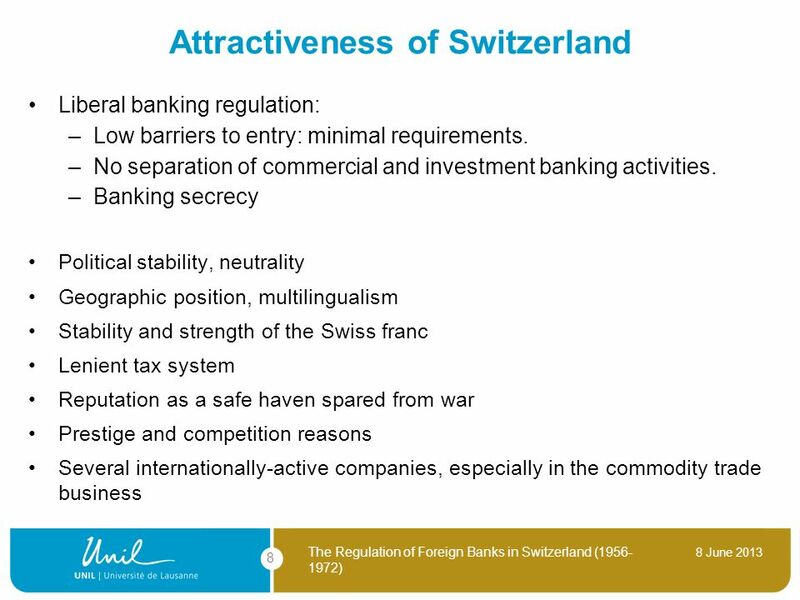 Download ppt "The Regulation of Foreign Banks in Switzerland ( )"
The Competitive Market in Public / Private Education. 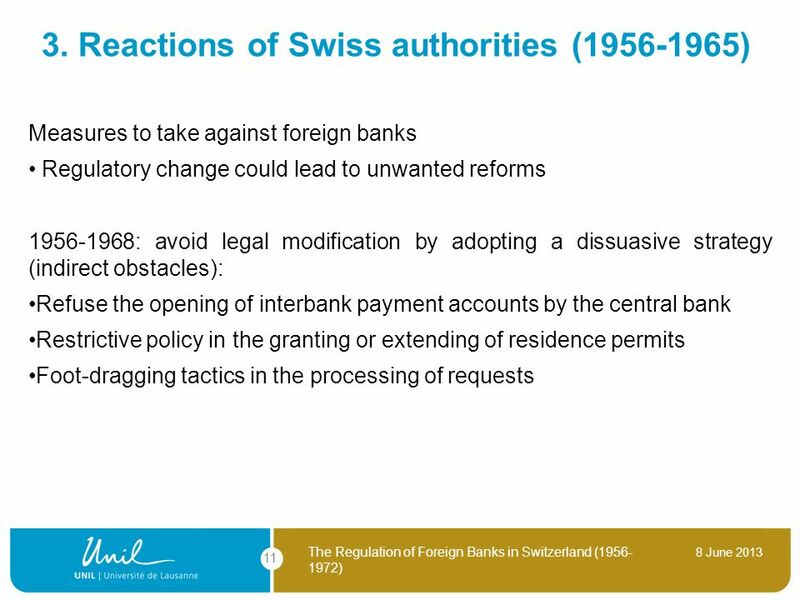 1 Regulatory Reform of Domestic Regulations in the Telecommunications Sector - Japanese Experience- FURUICHI, Hirohisa Senior Advisor General Affairs Division.